Capturing the natural renewable resource of solar energy is the power of choice for the natural tourist destinations of the west coast of America. It seems it is for many of the sunnier countries on the North and South American countries. It´s a good thing too, with tourism one of the largest industries in the world, it has the potential to make or break our planet by depleting its resources or helping to educate people on how to use them more wisely. The potential of the southwest to meet the growing energy needs of the rest of the states is huge particularly with the advances of photovoltaic cells and in light of the crude oil crisis. One of the 7 wonders of the world, the Grand Canyon which attracts millions of people each year, uses renewable energy to run its facilities. Situated in the ´Solar Capital of the World´ this canyon is not just great for its size (1 mile deep by 18 miles wide), this beauty has a lot to offer in regards to sharing its solar power knowledge with the people that come to view her from all corners of the globe too. The seven solar arrays produce up to 18 kilowatts of energy and supply a third of the power used by the visitor centre on the south rim. Per year the system produces 28,800 kilowatt hours of energy which is enough to power two homes in the sunny state. Any unused energy is sent into the grid and distributed to other buildings that can utilize their solar power. But harnessing solar energy is not such a new concept at the Grand Canyon. In 1200 AD the ancestral Puebloans (early Native American people) lived in this wonder until the 13th century AD. Though Arizona is a desert state it is not hot year round (frost on our hire car in the middle of October prove it!). To combat the cold the Puebloans built their dwellings facing south to maximize exposure to the warmth of the low-arcing sun of the winter months. 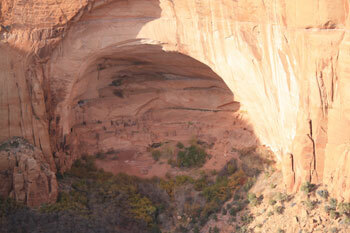 This was also true for the Puebloan cave ruins of Betatakin (see picture below). 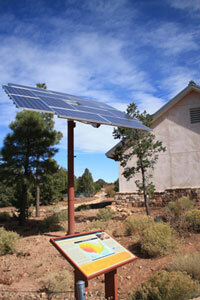 It’s not just solar energy helping to keep the Grand Canyon green and clean. The National Parks service has placed recycling bins everywhere. There’s also no heating from the restrooms dryers or hot water in the taps. Nor will you find drinking water from the fountains during winter to help preserve water. There are free shuttle buses that take people to forest trail heads to prevent car congestion and pollution in the park. The forest service is excellent at advertising their ´Back Country Ethics´ throughout the south west also. From information on setting up camp the green way to personal rubbish management, conscious campfire building and sanitation, the service provides through guidelines to ensure people reduce the amount of damage on the ecosystem of the natural environment they are enjoying.